Hallmark's THANKSGIVING WEEK hosted by CANDACE CAMERON BURE is Coming! Feast Your Eyes on all the News!!! As families gather to prepare a mouthwatering Thanksgiving feast, Hallmark Channel gifts its viewers with "Five Nights Stuffed Full of Original Holiday Movies!" The network satisfies your craving of more original holiday movies with a Thanksgiving week full of stars including Melissa Joan Hart, Dean Cain, Taylor Cole, Alicia Witt, Oliver Hudson, Tom Skerritt and more. The event features five holiday movie premieres every night at 8 p.m., anchored by the "blue sapphire" anniversary of Hallmark Hall of Fame -- 65 years as TV's longest-running and most award-winning series of all time. The 255th episode of Hallmark Hall of Fame, "A Heavenly Christmas" starring Kristin Davis, Eric McCormack and Shirley MacLaine, features an anthemic and dramatic new show open and Glenn Close as series' new voice. Candace Cameron Bure hosts the Thanksgiving week celebration, concluding with a special presentation of her new original Christmas movie, "Journey Back to Christmas," on Sunday, November 27 at 8 p.m. ET/PT. 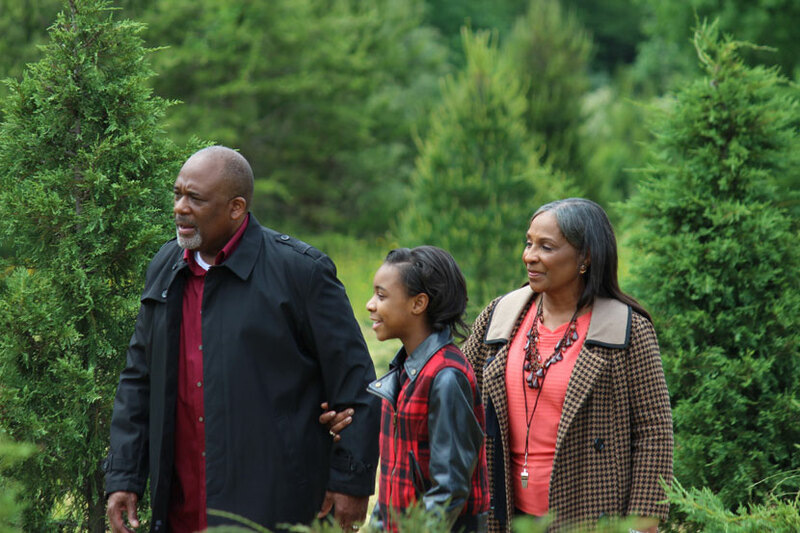 Gather your family for a week stuffed with love, laughs and adventure as Hallmark Channel fills your heart and home with the best in original holiday movies this season! Below is a complete list of Hallmark Channel’s Second Annual "Five-Nights Stuffed Full of Original Holiday Movies." Please note the premiere of "Journey Back to Christmas" has moved to Sunday, November 27 at 8 p.m. ET/PT and "Broadcasting Christmas" will premiere on Wednesday, November 23 at 8 p.m. ET/PT. Thanks in advance for making the change to your editorial calendars. Meredith Martin (Hart) is an ambitious television anchor, aimed at climbing the ranks. When the prized position presents itself shortly before Christmas, Meredith is ready to leap. 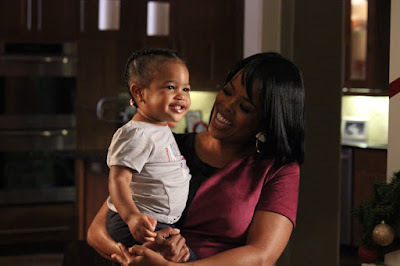 To her surprise, she discovers she has stiff competition with Nolan Barnes (Cain), the local TV anchor who is her near equal on another station. With such interest and support for both reporters, a contest is drawn up:　for the two weeks leading up to Christmas, who can cover the best and most meaningful Christmas stories on the local news? Meredith and Nolan go toe to toe. The surprising turn of events is that Nolan and Meredith start to realize top prize is not really as important as they thought. The true meaning of Christmas and the heartfelt experiences that stand out in the stories they’re covering challenge their career ambitions. This awakening also brings them into a connection they never saw coming as they start to fall in love. One of the most famous actresses in world (Cole) heads to the Christmas-obsessed town of Homestead, Iowa to shoot a holiday-themed. She is thrown for a loop when a romance brews between her and local inn keeper and single dad, Matt (Rady). As she gets a taste of small-town life and people who give of themselves without asking anything in return, she discovers the true meaning of Christmas. Isobel Gray (Witt) plans a storybook Christmas with her boyfriend (Hogan), including a snow-covered cottage in the Northwest, and a carefully composed bucket list of classic holiday traditions. 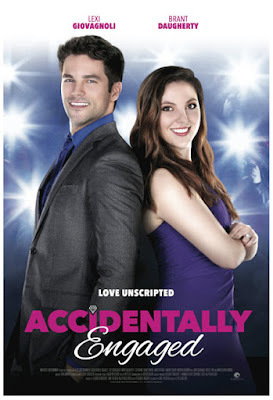 But when the boyfriend goes AWOL, the list proves challenging and a tempting new romance turns her life upside down. Will Isobel have a White Christmas ending under the mistletoe? 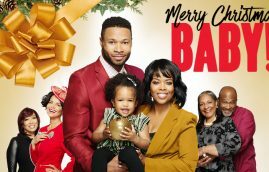 Upon her untimely death, Eve Morgan (Davis), a workaholic finds herself　tethered to her guardian angel (MacLaine) learning to become a Christmas angel in Heaven. Despite being the worst recruit in the history of Christmas, Eve is assigned the difficult task of helping a struggling singer Max (McCormack) use his musical gifts to heal old family wounds. 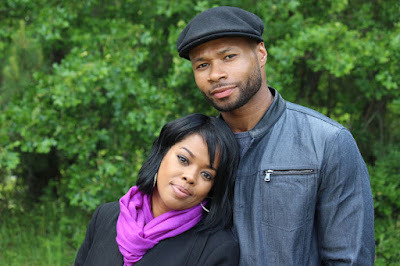 As Max begins to overcome his issues, Eve begins to embrace the meaning of Christmas, heal wounds of her own and perhaps find love along the way. A WWII era nurse (Cameron Bure) is transported in time to 2016 and meets a man (Hudson) who helps her discover the bonds of family and that the true meaning of Christmas is timeless. 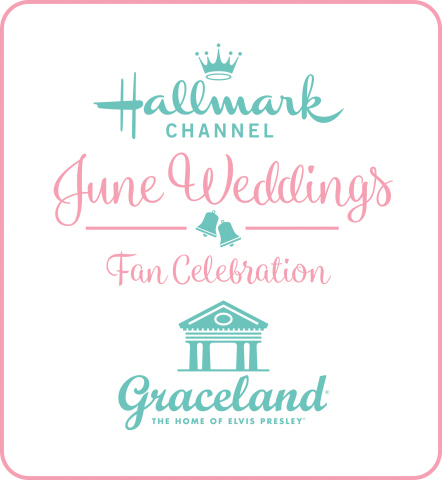 Hallmark Channel is Crown Media Family Networks’ flagship 24-hour cable television network, distributed nationwide in high definition (HD) and standard definition (SD) to 89 million homes. 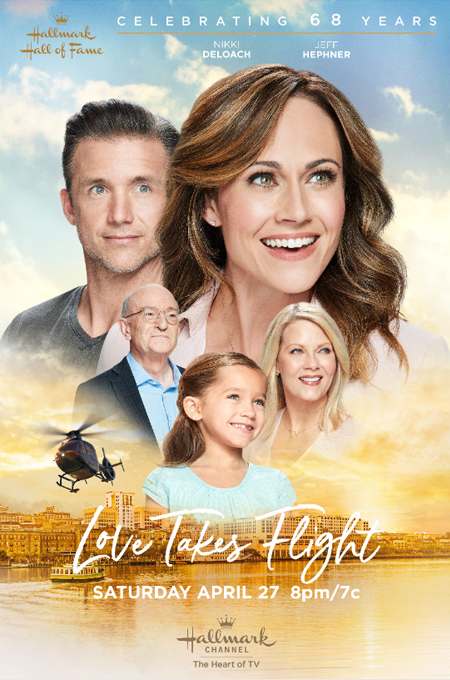 The country’s leading destination for quality family entertainment, Hallmark Channel delivers on the 100-year legacy of the Hallmark brand. 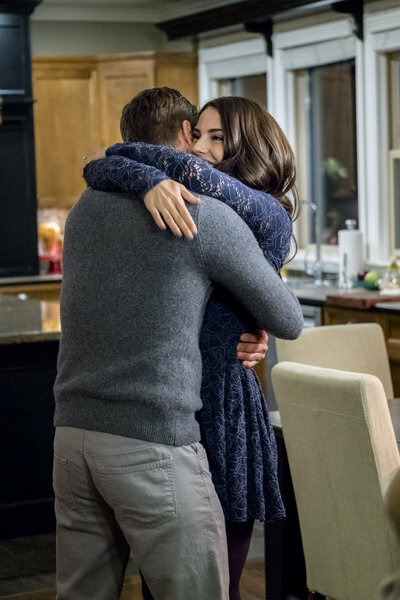 In addition to its signature original movies, the network features an ambitious lineup of other original content, including scripted primetime series, such as Good Witch and When Calls the Heart; annual specials like Kitten Bowl and Hero Dog Awards and; a daily 2-hour lifestyle show, Home & Family. 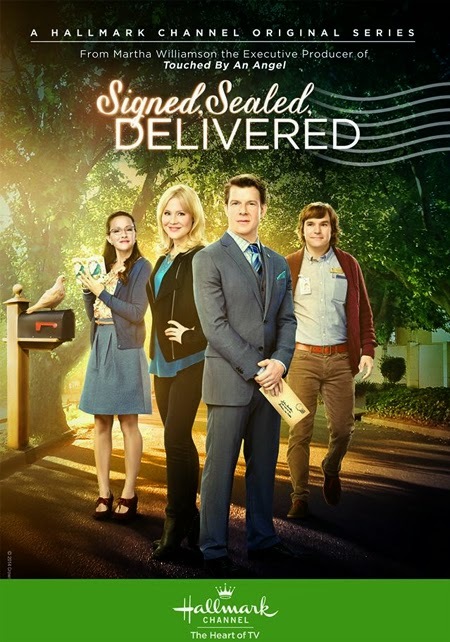 Additionally, in November 2014, Hallmark Channel became the exclusive home to world premiere presentations of the acclaimed Hallmark Hall of Fame franchise. 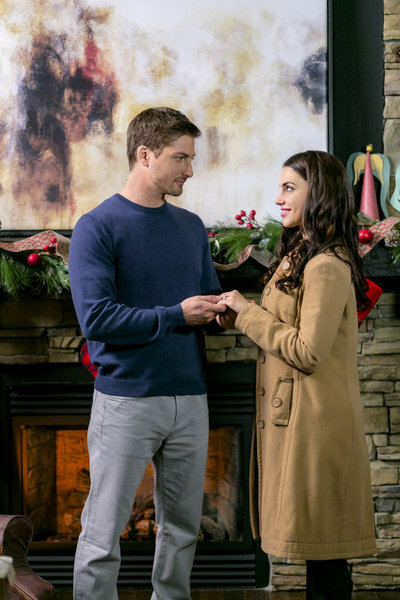 Dedicated to helping viewers celebrate life’s special moments, Hallmark Channel also offers such annual holiday programming events as Countdown to Christmas and Countdown to Valentine’s Day. Rounding out the network’s diverse slate are television’s most beloved sitcoms and series, including The Golden Girls, The Middle, Last Man Standing, Little House on the Prairie, and Frasier. Every CHRISTMAS MOVIE is a TREAT!!! I hope You ALL are enjoying ALL the CHRISTMAS MOVIES on the Hallmark Channel and Hallmark Movies & Mysteries! I certainly know I am, along with ALL my Family!!! 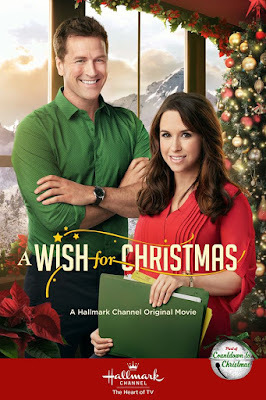 It is such a TREAT to have them early and I adored the new Lacey Chabert and Paul Greene movie, 'A Wish for Christmas!' So cute! A perfect start off to the Hallmark Holiday Season! I just loved... when Lacey Chabert's character Sara Shaw said (paraphrasing here) she loved to decorate before the department stores and Paul Greene's character Peter asked something like... What are we talking here, before Halloween?... and she replied something to the effect of... She would love to do it before Easter, if she could!!! LOVED that comment!!! That should have definitely been in the promo - especially since it aired before Halloween! I could totally relate to that feeling!!! Anyway, I'm busy updating the Christmas TV Schedule some more today!!! I just wanted to take a minute and share in this special treat with all of you! 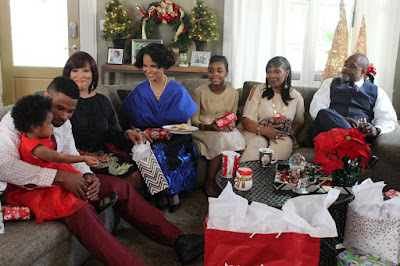 Thank you Hallmark for bringing the joy of Christmas to our homes!!! Hallmark's First "Countdown to Christmas" Movie for 2016 - 'A Wish for Christmas' starring Lacey Chabert & Paul Greene & More This Weekend!!! 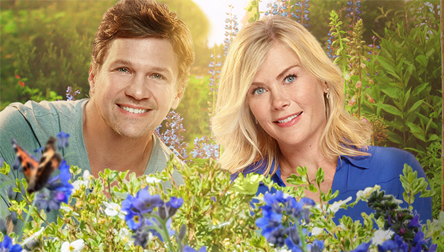 on the Hallmark Channel at 8pm/7c. Hope you all enjoy this First Full 24-7 Weekend of Christmas TV Movies, including the premiere of 'A Wish for Christmas', plus 'A Christmas Melody,' Signed, Sealed, Delivered: For Christmas,' 'A Royal Christmas,' 'The Christmas Secret,' 'A Season for Miracles,' 'Snow Bride,' 'A Grandpa for Christmas,' 'The Nine Lives of Christmas,' and so much more!!! 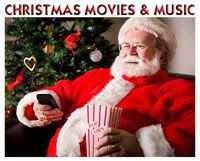 Be sure to visit the Christmas TV Schedule to find out when you can see your favorite Christmas Movies this weekend!!! 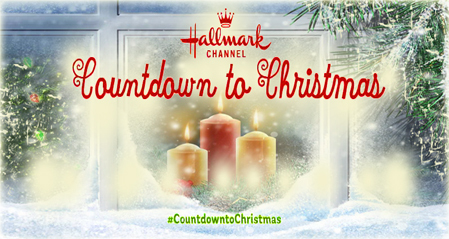 LET the COUNTDOWN to CHRISTMAS on HALLMARK Begin!!! CHRISTMAS MOVIES begin at 10PM/9c. right after the 2016 Hero Dog Awards!!! You have a choice to watch two great channels for Christmas from now until January 1st, 2017! 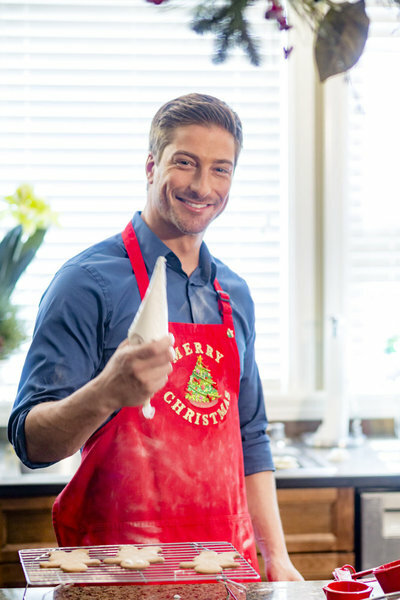 The Hallmark Channel will feature 19 New Christmas Premieres and Hallmark Movies & Mysteries 7 New Premieres amidst many well loved Hallmark films from years gone by! 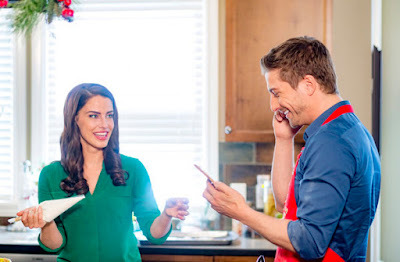 Two of this years new movies include the actors from the popular Hallmark series 'When Calls the Heart,' Daniel Lissing and Erin Krakow. Both will be starring in new Christmas movies! 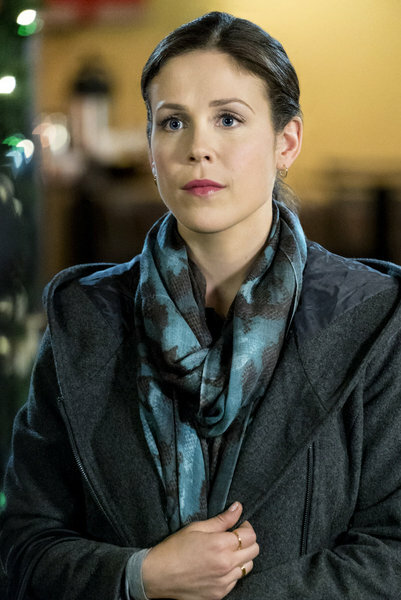 Erin Krakow will first star in 'Finding Father Christmas' on Hallmark Movies & Mysteries (November 13th) and Daniel Lissing will be starring in 'A December Bride' (November 20th). Then, on Christmas Day they will star together in the all new 'When Calls the Heart Christmas!' There are many exciting movies and specials to look forward to this Christmas season, whether you watch the Hallmark Channel or Hallmark Movies & Mysteries!!! Blessings to you all as we begin the 2016 Christmas journey! Enjoy and embrace every moment! 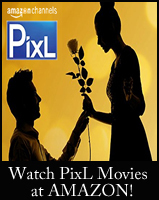 Be sure to visit the Christmas TV Schedule to see when your favorite movies are on this year!!! 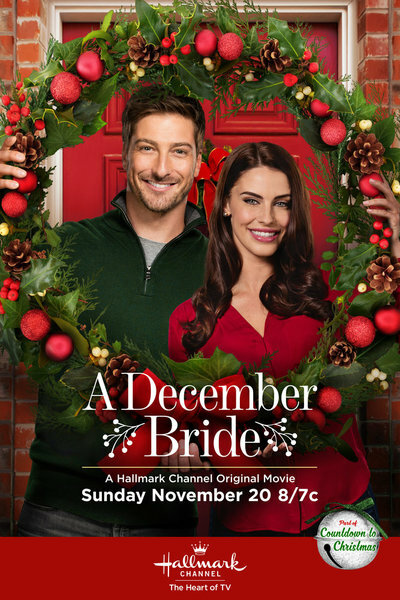 *A December Bride is Available on DVD - ➤Click Here! *Based on the book A December Bride by bestselling author Denise Hunter. 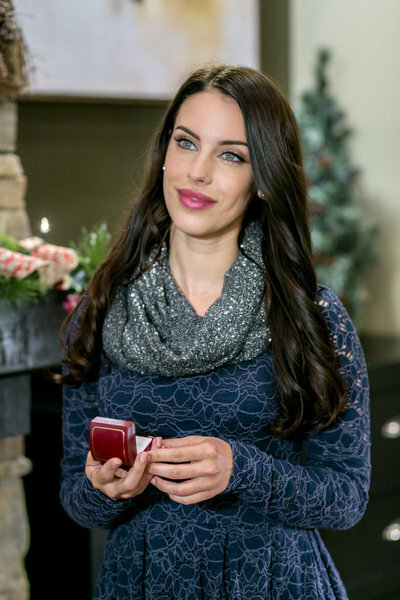 via Hallmark: Aspiring interior designer Layla O'Reilly is dreading the Christmastime wedding of her cousin who's marrying Layla's ex-fiancé. Although Seth Murphy is the one responsible for introducing the bride and groom, she begrudgingly accepts his offer to be her date as she's out of options. Seth gets carried away at the reception and announces they're engaged, forcing a mortified Layla to keep up the pretense. But as the faux couple spends more time together they find themselves feeling something very real. This is an Archive of the Family TV Schedule from October 2016 for your reference. See the current Family TV Schedule for updated TV news. CHRISTMAS on TV is ONE DAY AWAY!!!!! Ready or not, in ONE MORE DAY - CHRISTMAS, Yes CHRISTMAS returns to our TV's in a BIG WAY! 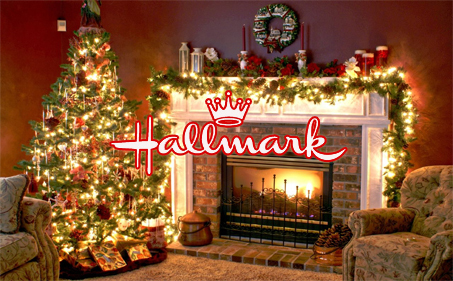 Hallmark is gifting us once again this year - with their collection of Christmas movies, nearly 24-7!!! For those of you who have both Hallmark stations, the Hallmark Channel & Hallmark Movies & Mysteries... you will be able to choose between either channel in watching Christmas movies for the next TWO Months!!! 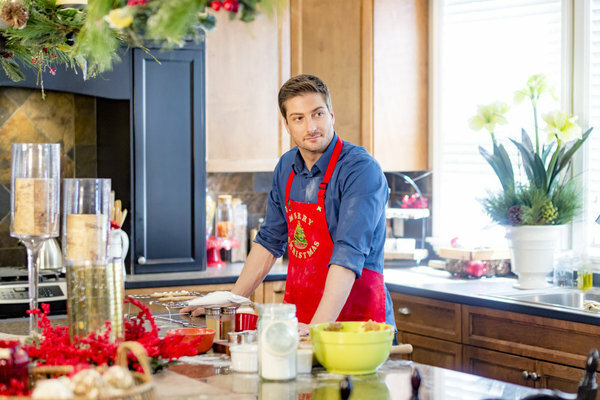 *Some Hallmark Movies have changed in the schedule on Thanksgiving week + 1 was re-named - see details, HERE! *Also, check out news on Freeform's 25 Days of Christmas - HERE!!! Freeform's 25 DAYS of CHRISTMAS Schedule - 2016! 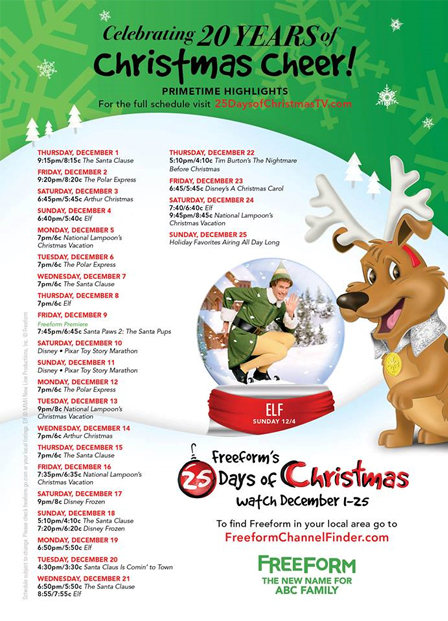 Freeform's 25 days of Christmas is HERE!!! Check out the Full Freeform Christmas Schedule - HERE! 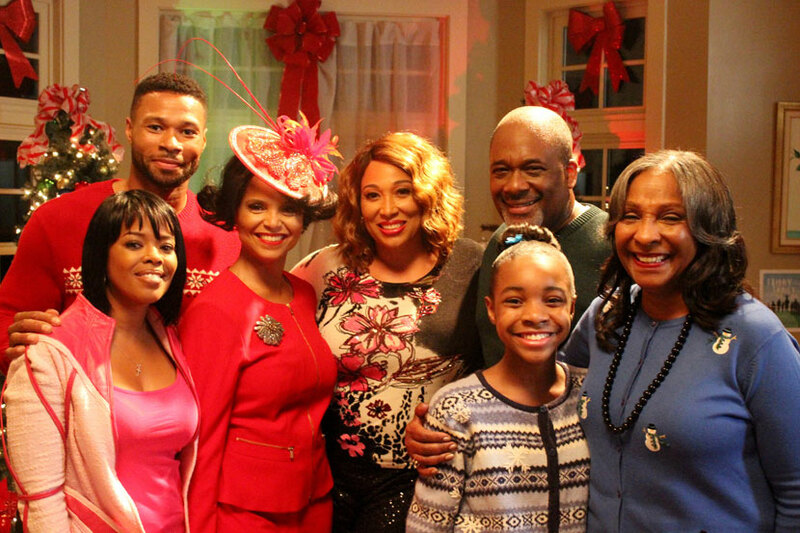 It's a Wonderful Movie - Christmas TV Schedule soon! 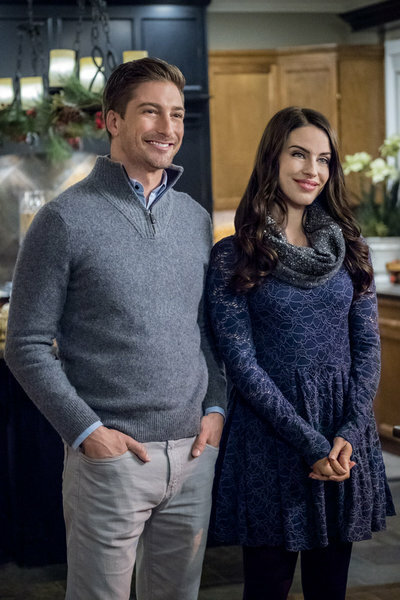 Unfortunately, the fan favorite "The Christmas List" with Mimi Rogers and "Christmas Every Day" with Erik von Detten will not be seen again this year. UPDATE: I just discovered - "Holiday Joy" is the new Christmas Movie with Bailee Madison!!! (3:00 - 5:00 p.m. EST) HOLIDAY JOY - NETWORK TELEVISION PREMIERE Joy Hockstatter (Bailee Madison) has been trying to help her dad, Bob, hold the family together after her mom's death a few years ago. Although only 15, she's become a kind of surrogate mother to her brothers. Every day she looks across the street to the perfect house and family - the Wellmans. After a freak accident (which involves some suspicious cards), Joy wakes up as one of the Wellmans, with a new mother, father and older sister! Her new life seems to have changed for the better, only now Bob and her brothers have taken a turn for the worse and the only one who recognizes Joy from her previous life is her old dog, Levi. "Holiday Joy" repeats on Friday, December 9, at 11:30 a.m. EST; and Thursday, December 15, at 7:30 a.m. EST. CLICK HERE FOR EVEN MORE DETAILS + IMAGES OF BAILEE MADISON IN HOLIDAY JOY!!! Please share what you think of the schedule in comments below!!! *Thank you, Eddie, for sharing the Freeform schedule! 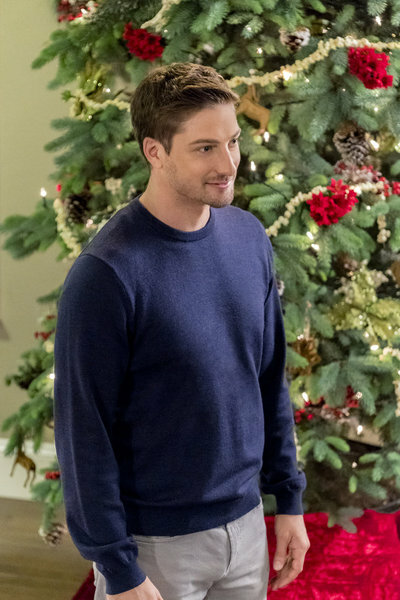 We are TWO days away from Christmas movies airing on TV - on the Hallmark Channel & Hallmark Movies & Mysteries - starting October 28, 2016 at 10pm/9c.! The elves must be very busy preparing at the North Pole, since we are now less than TWO months away from actual Christmas Day!!! How fun... we can all start our wait for Santa together!!! 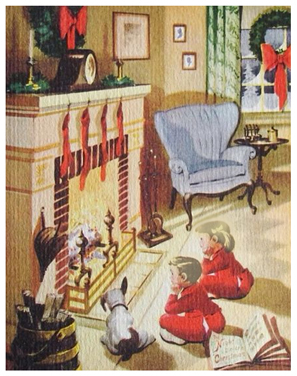 Vintage Christmas Card - Waiting for Santa! 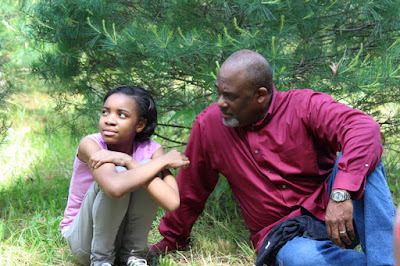 I've been extra busy adding and updating to the web-site Christmas Movie images & schedule details! My most recent update: I have added to the schedule all the premiere dates and re-air dates for all of the new ION Christmas Movies! 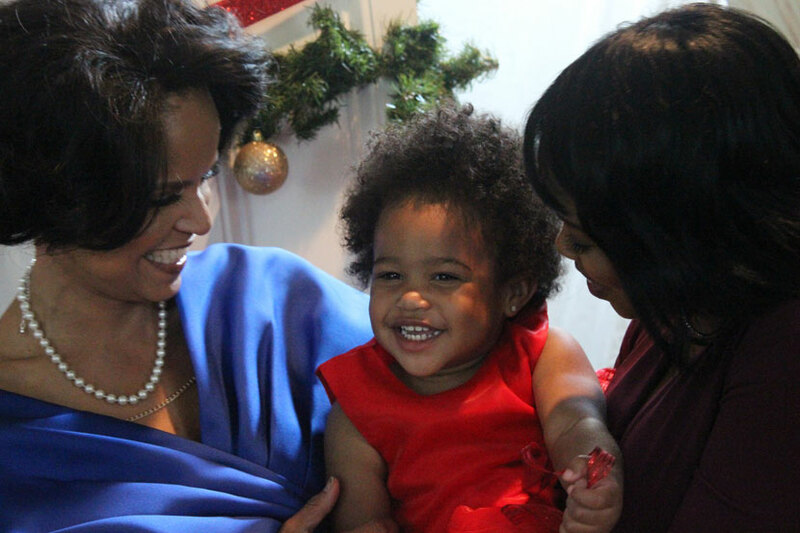 For instance, 'A Firehouse Christmas' will premiere Saturday, December 3 at 9pm|8c. And, it will repeat... Sunday, December 4 at 5pm|4c. and Saturday, December 24 at 3pm|2c. Check out the Christmas TV Schedule to see all the times listed for all the new ION Christmas Movies! Be sure to search on the page for each new title: A Vermont Christmas Vacation, A Firehouse Christmas, A Cinderella Christmas, Christmas with the Andersons, and A Husband for Christmas. Also, newly added to the schedule is the CMA Country Christmas music special, which will be hosted once again this year on ABC by country singer and star of Dolly Parton's 'Coat of Many Colors' and the much anticipated new movie 'Christmas of Many Colors: Circle of Love,' Jennifer Nettles. 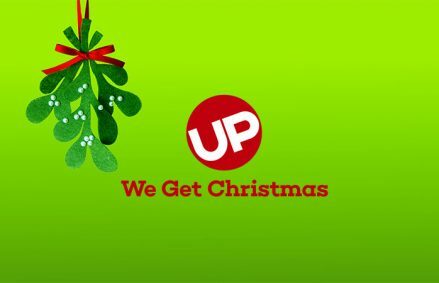 Except Sundays, the Christmas TV Schedule will be updated nearly every day throughout the Christmas season! 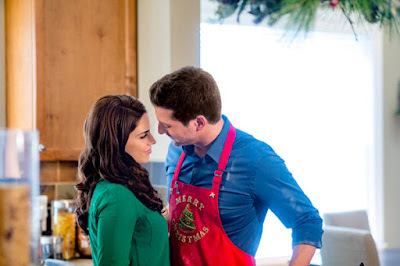 So, you'll want to keep a close eye on it for any changes or additions - including more Hallmark Christmas movies added to the schedule + INSP and Lifetime Christmas Movies!!! 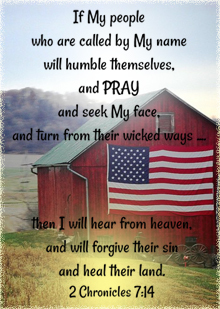 God's Blessings to you all... those sleigh bells we heard not so long ago in the distance... are getting louder... it's almost here!!! check out "Christmas Is" by Francesca Battistelli! via UP: The Chandler family is back and bigger than ever in the fourth installment of the “Marry Me for Christmas” franchise. 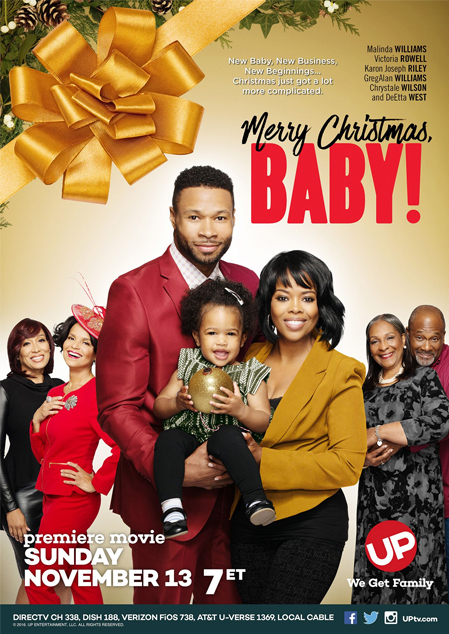 Determined to make her baby’s first Christmas a memorable one, Marci (Malinda Williams) throws herself into both planning the perfect Christmas and building her new event planning business. But when the business gets off to a rocky start and members of her family face their own hardships, Marci will discover that when your plans for a perfect Christmas start to fall apart, it just might be the miracle you need.